Canine insomnia sounds like an oxymoron since, after all, dogs seem to be able to sleep anytime and anywhere. Indeed, dogs do not suffer from insomnia too often. But they do get sleepless nights from time to time, and there are many possible reasons that could cause insomnia in dogs. If a dog cannot sleep, especially for several days in a row, then we have to pay attention because most likely there is something wrong with the dog. 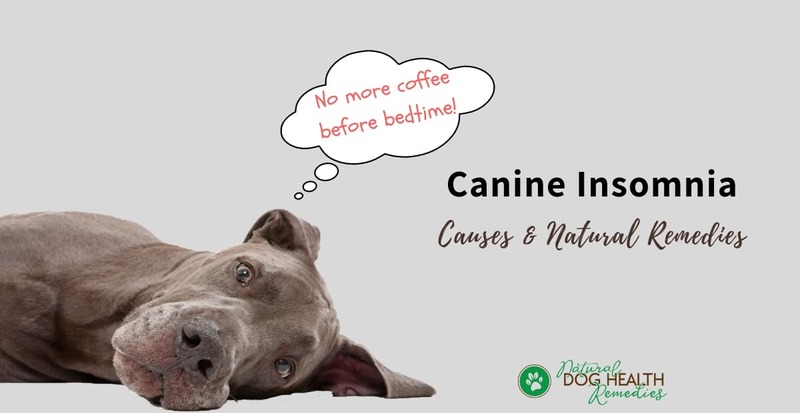 This page looks at some possible causes of canine insomnia, some natural sleep remedies for dog insomnia, as well as things we can do that can help an insomniac dog go to zz-Land. Just like us, dogs find it difficult to sleep if there is tension in the house, or if he is feeling anxious or stressed. Remember, dogs are very sensitive and can pick up feelings and emotions from their human buddies. If there is tension between family members, or if there is a visitor sleeping in the house, your dog may get nervous and restless and cannot get to sleep. Thyroid problems (e.g. an overactive thyroid gland). Some medication, such as corticosteroids (e.g. Prednisone) can cause numerous side-effects to a dog, one of which is insomnia. Older dogs (like older people) are more likely to wake up easily than younger dogs because they tend to have more aches and pains and other health problems. Also, their hearing and eyesight may be weakened and so sometimes some older dogs may become afraid of the dark. Some older dogs also suffer from cognitive dysfunction, and they tend to wake up and vocalize in the middle of the night. We sleep better if we have enough exercise during the day - so do dogs! If a dog is not getting enough exercise, he may have too much pent-up energy that he is simply not tired enough to have a full-night sleep. Your dog has recently started to drink more water and the need to urinate has become more frequent. Your dog has been hit by a car or has had some kind of physical trauma, even if she seems fine afterward. Your dog seems stiff, and his joints are swollen. Your dog wakes up at night and starts whining or crying as if in pain. Your aging dog is starting to act disoriented (e.g. does not know where he is), and/or clumsy (e.g. bumps into furniture). Your dog wakes up at night, shivering or shaking even when it is not cold. Herbs such as valerian, chamomile, and passionflower have calming properties and are effective in helping insomniac dogs. Use the tinctures of these herbs. Combine equal parts of valerian and passionflower (or chamomile) and give 4 to 8 drops of the herbal mixture to your dog (depending on his size). The herbal remedy should be given about one hour before bedtime. 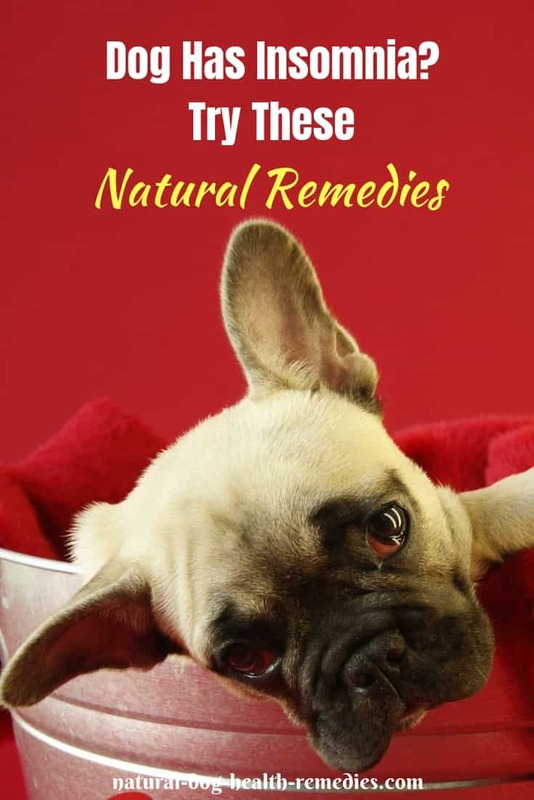 You can give this remedy to your dog for up to two weeks. Flower essences are very effective in getting rid of negative emotions such as anxiety, fear, and nervousness caused either by physical problems or because of the dog's surroundings. If your dog cannot sleep due to physical discomfort, pain, or fear, try using the flower essence Bach Flower Essences Rescue Remedy. Use about 2 drops and rub the remedy directly on your dog's gums to relieve any anxiety. Diffusing essential oils with calming effects in the room where your dog sleeps can also be helpful. Diffuse a few drops of any of these oils (or a combination of 2 to 3 oils): Lavender, Roman Chamomile, Clary Sage, Sweet Marjoram, Valerian. You can also put one or two drops of Lavender directly on your dog's bed. Lavender is safe, soothing, and calming and can help your dog sleep better. This spray uses relaxing and calming oils of valerian root and lavender, and can be used to spray your dog's bed, crate, or the whole room. This may just be the thing to get your dog to sleep! You may also try to play some soothing and relaxing music for your dog, especially if your dog's sleeplessness is caused by old age, anxiety, nervousness, and the like. Some dog parents have found music to be just the thing to coax their dogs into slumberland. There is music that's created specifically to calm and relax dogs. Try it - you may be surprised how well it works! How About Sleep Meds for Dogs? Some vets suggest using medication to help dogs get to sleep. One commonly used medicine is Benadryl®. Although strictly speaking, Benadryl® is not a sleeping pill, its side effect is sedation (although the effect usually wears off in a couple of days). But honestly, would you like to use a drug to get your dog to sleep? While Benadryl® is relatively safe, still it has to be broken down and metabolized in the liver. It may not be a good idea to add stress to your dog's liver, especially if your dog is older, or has existing liver problems. Perhaps the best approach is to first try different natural sleeping aids for dogs to see if they work for YOUR dog, and use medication as a last resort. Give your dog a workout (long walk, jogging, frisbee) every evening - A tired dog can naturally sleep more soundly. Dogs suffering from arthritis need a softer bed for better cushioning. If your dog has arthritis, consider getting his an orthopedic bed. Also move his bed to a quiet and warm place. As mentioned above, some older dogs may be afraid of the dark because they cannot see and hear as well. If this is the case for your dog, get a small nightlight and leave it on near his bed to help ease his mind. Young puppies, older dogs, as well as dogs with health problems (such as incontinence, diabetes) need to go to the bathroom more often. If your dog wakes up at night because he has to relieve himself, let him outside before bed time or train him to use a wee wee pad. Dogs in pain cannot sleep well. Use natural herbal pain remedies to help them relieve pain.